With the number of Macs growing, especially in the academic and consumer fields the need to support them has become a must have for many existing Windows environments. The question becomes, "How does the competent Windows IT professional open up their print server to their Mac clients?" 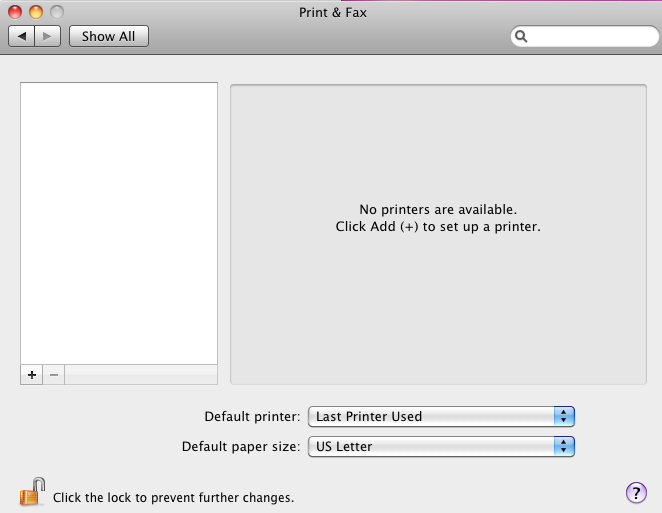 There are a several methods of allowing the use of your networked printers to Mac OSX clients. Below is summary of each method and a brief of the pros and cons. This is the easiest to install, and often the most reliable method of printing from Mac OSX to a printer queue installed on a Windows Server. Job is submitted within Windows as the logged in user. 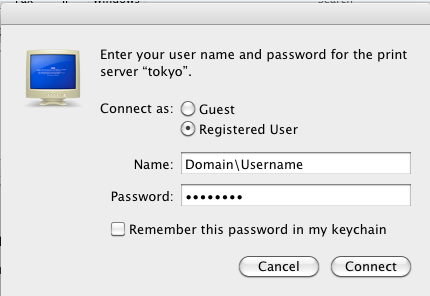 This is especially useful when using Active Directory services for Mac. Full document title information as set by the printing application is received by server. Does not encounter common Kerberos authentication issues such as the popular NT_STATUS_ACCESS_DENIED error for no apparent reason. Uses a separate port (515), from Windows File and Print Sharing (445).This allows for advanced security options via the Windows firewall to help allow fine tuning which systems or subnets can print via your servers LPD printers. 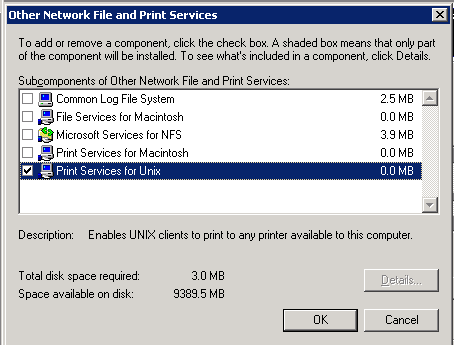 Requires installation of the Line Printer Daemon printing services, also known as Print Services for Unix on your Windows Print Servers. Not all Macintosh printer drivers support this method of printing. This option has become greatly popular, especially in the more recent releases of Mac OSX Leopard, Snow Leopard and Lion). In many environments this option can seamlessly integrate printing with a few clicks, and no additional configuration on your print server. Full Document Title information is not available on the print server. The queue will show "Remote Downlevel Document" in lieu of a usable title such as "A Good Presentation.pdf"
Connects to existing Windows shares, does not requires additional server configuration if printers are already shared to Windows users. Can be difficult to troubleshoot some authentication issues. Supported by nearly all Mac printer drivers. This legacy technology is no longer supported by Apple on their newer Operating System releases. While it can still be found in use within older networks, it is considered retired and will not be covered within this article. This option should only be used as a last resort, as it makes any management or control of printing resources very difficult at best and should be avoided. Installing printers in this manner will not be covered in this article. Little or no control or tracking of printer and associated printer costs. Little or no security options for printing. Typically supported by all Mac drivers. 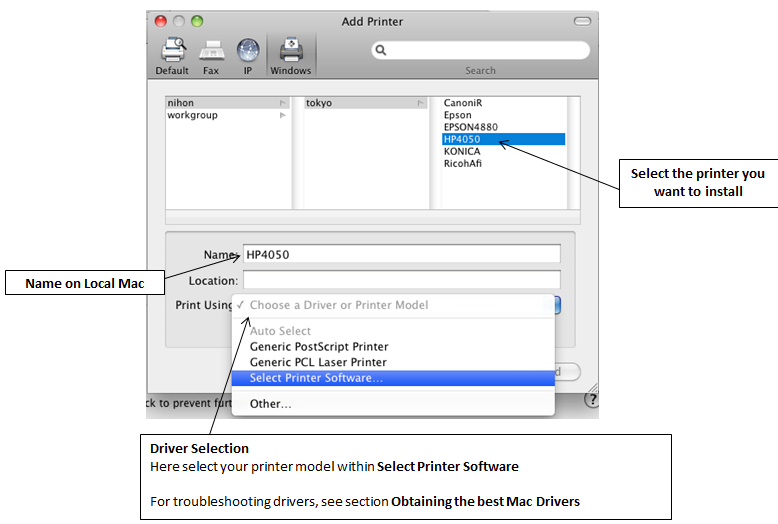 This section covers setting up this service, and installing and using a printer on Mac OSX. 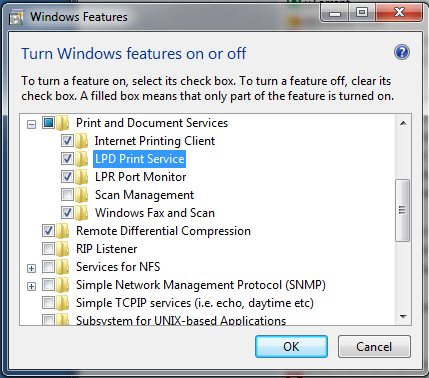 The first step in allowing printing is to enable the LPD service within Windows. This varies slightly between operating system. The below steps specifically apply to various server operating systems. 1. 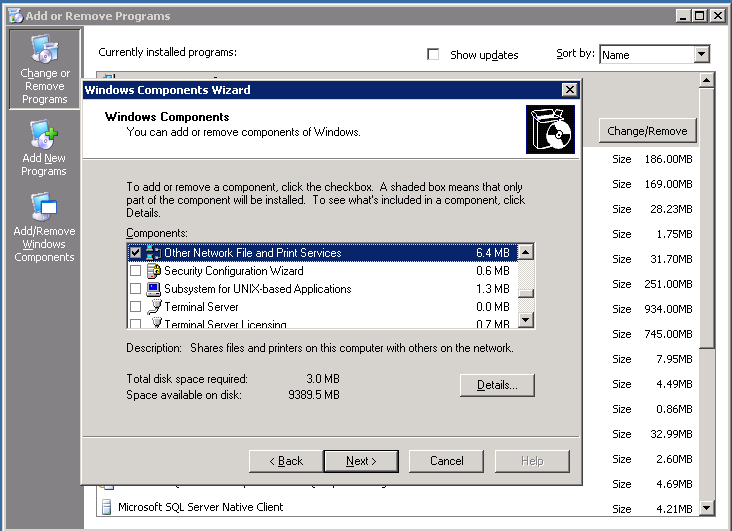 Open Add/Remove Windows Components within Add/Remove Programs. Within this location Other network File and Print Services. 2. Within that Role, click the Add Role Services. Here you can add the LPD Service. 3. Once the role has been installed, you are ready to install printers onto your Workstations. 2. The Windows Features dialog will open. 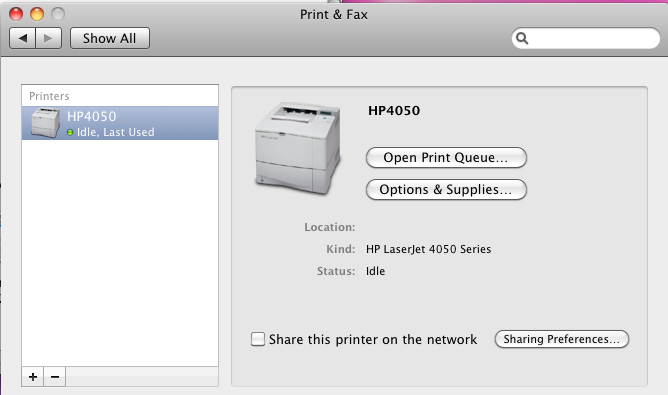 Locate Print and Document Services and enable the item named LPD Print Server and then click [OK]. 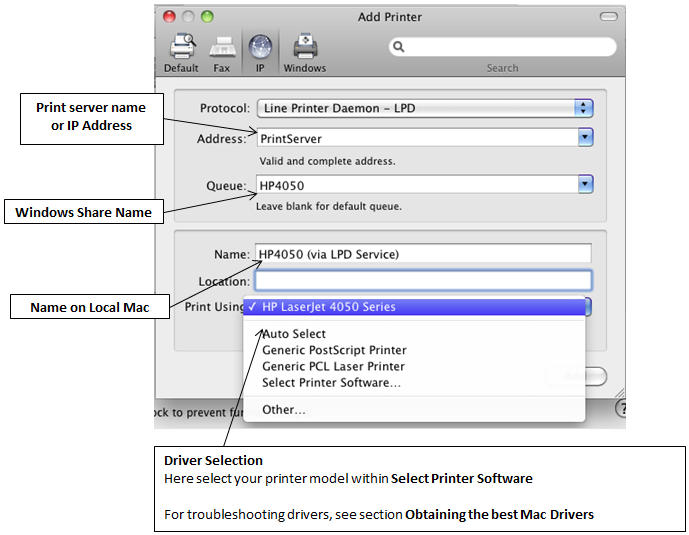 The next step is to install the printer onto your Mac OS X system using the following steps. 1. 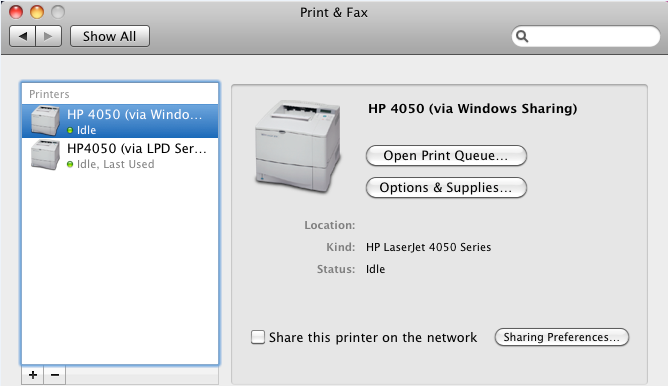 Open Print & Fax within the System Preferences of your operating system. 2. Click the [+] button towards the bottom right to install your first printer. The add printer dialog will appear. From here click on the [IP] button at the top of the dialog and then choose Line Printer Daemon – LPD within the Protocol drop down list. 3. Once selected a variety of fields need to be filled in to reference your printer on your print server. The below should guide you to each one. 4. Once all is configured, clicking Add should finalize the installation of the printer. Open Print & Fax within the System Preferences of your operating system. Click the [+] button towards the bottom right to install your first printer. The add printer dialog will appear. From here click on the[Windows] button. After clicking the [Windows] button, the browse dialog may appear black for several minutes. The system is actually busy locating the available Windows networks, but does not have any indication of this. Once the networks have loaded, you can click each network to list the servers within the network. Clicking on the server, will attempt to load the printer shares on that server. Again each click of network or server may take several minutes to load without any indication that it is busy. Depending on if you are authenticated, you may next get prompted for a username and password to view the shares on the server. You will need to enter your domain credentials. After this you will see the list of shared printers. The printer will not be installed and usable. A common issue that comes up when using either of these forms of printing, are ensuring the user printing from Mac is the correct user so their printing can be managed and tracked properly. Consider these two scenarios. In this case, the user logged in may not exist in Active Directory and may be a local user that does not reference or match any AD user printing account for quotas and restrictions. In this case, all print jobs are sent as the first user who happened to click Save my password. In a print tracking scenario, this would show a false statistic regarding who is actually printing each job. The solution to these issues, is Print Manager Plus with the Client Billing & Authentication add-on option. This add-on option requires explicit authentication on each print job by interacting with the Authentication Module running on each Mac. This will provide the following functionality, on top of all of the tracking and control functionality included with Print Manager Plus. This final section includes some tips for obtaining Mac versions of drivers for the various models of printers that exist. Below are three most common means of finding and selecting a driver. The most popular source of drivers is through your printer manufacturers website. Most modern printers are well supported under Intel based Mac OSX 10.5 and later systems. Browsing their support. In rare situations, a manufacturer will not provide any Mac drivers for their device. In rare situations, the driver they provide may support the LPD method of printing described above. If you are having trouble obtaining drivers for your printer, or are having trouble getting them to work via the LPD print server, you may want to consider third party drivers. Gutenprint, also known as Gimp-Print is an open source community project designed to provide fully functional drivers for a large variety of print devices. The list is vast, but does not support all printers. May not provide all of the advanced printing options your device is capable of. The final step is to use generic drivers using either the Postscript (PS) printing language, or the Print Control Language (PCL). These are available directly when installing the printer. Provides a limited set of basic printer features only. Will not support any advanced features your device may support.